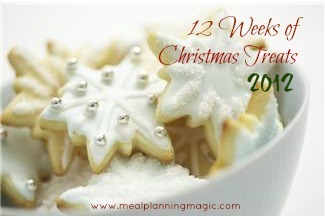 It’s the fourth week of the 12 Weeks of Christmas Treats blog hop hosted by Brenda Thompson from MealPlanningMagic.com. If you’d like to join us, please fill out the form on Brenda’s blog. Most of my Christmas treats are cookies. Hopefully you don’t mind this. This week I’d like to share a recipe that I got from a magazine that a friend of mine gave me a couple of years ago – Better Homes and Gardens Ultimate Cookies & Bars magazine. I added the Giant Ginger Cookies to my Christmas cookie list and made them last year. They were a hit. My husband has always hated gingerbread cookies but even he said that these are really good. Now I wouldn’t really consider these cookies giant – I reserve that for the cookies that are the size of a dinner plate – but they are larger than the average cookie (about the size of a coaster) and pretty thick too. 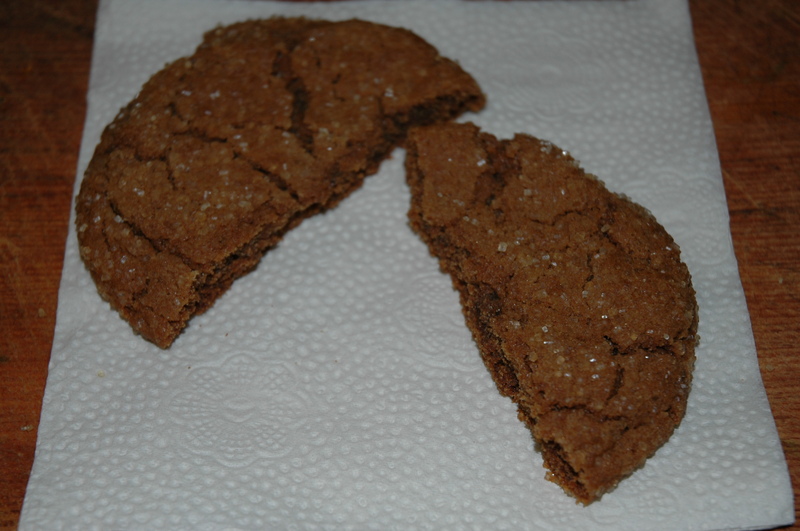 The demerara sugar coating gives the cookies great added texture. Ginger cookies always remind me of the holidays and they are a staple for most everyone. Step 2: Combine flour, ginger, baking soda, cinnamon, cloves and salt in a separate bowl and set aside. Step 3: Using an electric mixer on medium to high speed beat shortening in a large bowl for 30 seconds. Scrape the sides of the bowl as you go when necessary. Beat in the 2 cups of sugar. Combine eggs and molasses into the mixture. Beat in as much of the flour mixture as possible. Finish combining the remaining flour using a spatula. Step 4: Add the demerara sugar into a small bowl. Roll dough into 2 inch balls using a 1/4 cup measure or ice cream scoop. Coat with coarse sugar by rolling in the small bowl. Place 2 1/2 inches apart on the parchment lined cookie sheet (or ungreased cookie sheet). Step 5: Bake for 11 to 13 minutes or until bottoms are lightly browned and tops are puffed slightly. Cool cookie on racks for 2 minutes. Remove the cookies from the pans and let cool completely on cooling racks. Tips: Do not bake cookies too long. Sometimes it’s a bit annoying to measure shortening using the water displacement method, so this time I used Crisco Baking Sticks which are softer than regular shortening and are as easy to use as butter, since they are shaped like a stick and have the measurements similar to the way they are on a stick of butter. Storing: Store cookies in a sealed plastic container. The cookies are fine for several days when stored this way. Freeze up to three months. Do not store with cookies that aren’t spiced as the other cookies will take on the flavors of these cookies. Barely adapted from Better Homes and Gardens Ultimate Cookies and Bars magazine. This entry was posted in Christmas, Cookie, Dessert and tagged Christmas, cinnamon, cloves, cookie, ginger by Annamaria @ Bakewell Junction. Bookmark the permalink. Trust me, they’re good to the last crumb. Love ginger cookies–those look great! These are easy to make also. These look like the perfect holiday cookie! I am adding them to my baking list! Thanks for sharing! Thanks. Hope you enjoy them. with cinnamon, ginger and cloves it must smell amazing! They do smell wonderful and have the taste to match. I’m assuming ground ginger is what you’re using? They look fabulous! Sorry, it is ground ginger. I’ll update the recipe to be more clear. Thanks. They look delicious. My family loves ginger cookies and I haven’t made them in so long. Thanks. These are pretty hefty and I think your family would love these. We love ginger cookies here…and the bigger, the better! Oh my goodness those look divine! Love ginger cookies. The bigger the better. These don’t disappoint. You’d love them.